Taste: Madagascar 67% with Habanero Salt bar by Patric Chocolate. 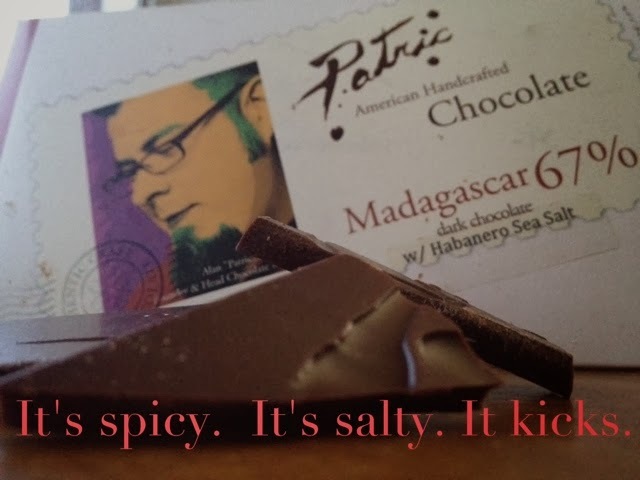 Allan McClure of Midwest based Patric Chocolate takes a Madagascar bar with silky texture and strong red fruit notes from nice to a bit naughty by adding habanero salt to the back side. Habanero always pairs up nicely with cherry notes. For those who prefer to savor the chocolate first before playing with fire, place the chocolate on your tongue salt flecked side up and allow the melt to reveal the heat slowly, otherwise the strong hit of salt and pungent kick will be sure to shock your taste buds. As always, I love to talk chocolate so let me know what you think. I found this bar at Chocolopolis in Seattle.